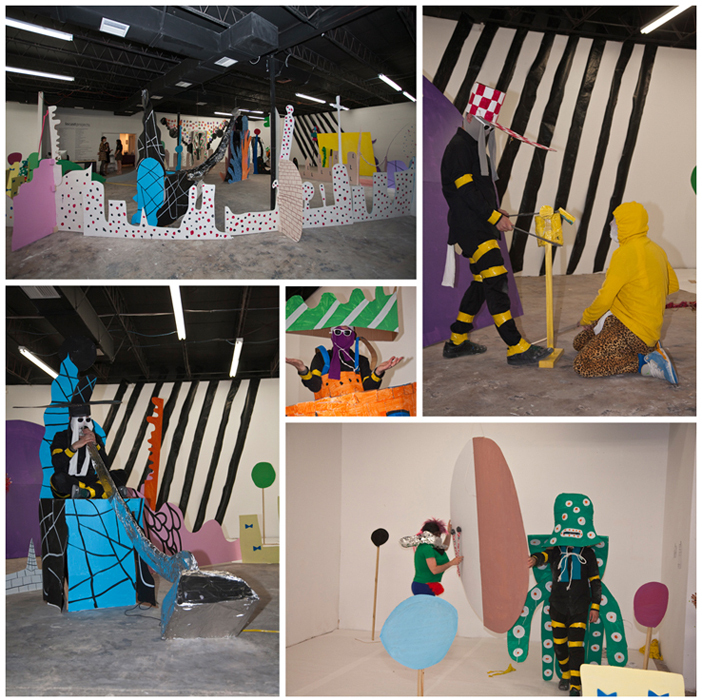 Conceived specifically for Locust Projects, Brooklyn-based artists Matthew Ronay and Nathan Carter will present an intuitive dance performance and a didgeridoo revue. To prepare for the performance both artists will spend several days making costumes, stage sets, and musical instruments based on misunderstandings of both Mummenschanz (a Swiss mime troupe started in the 1970s) and early Bauhaus performances. The artists will then quickly develop a series of hastily-choreographed dances inspired in part by avant-garde filmmaker and theorist Maya Deren's 1940s study of dance and possession in Haiti, and by audio recordings reflecting misinterpretations of modern dance and experimental music. Performances will be ongoing during the night. Nathan Carter's international museum exhibitions include THE FLYING BRIXTONBANGARANG AND RADIO VIBRATION VEX-VENTURE, MURA: Museo de Arte Raul Anguiano, Guadalajara, Mexico (2010). THE CONVERT CAVIAR FREQUENCYDISRUPTOR at ArtPace, San Antonio, TX, (2007-08); and YO PIERRE Domus Artium 2002, Salamanca, Spain (2007). Carter has also recently participated in a number of group exhibitions including Alexander Calder and Contemporary Art: Form, Balance, Joy originating at the Museum of Contemporary Art, Chicago traveling through 2012; Sculpture as Time: Major Works, New Acquisitions, Art Gallery of Ontario, Canada; and Drawing in Progress, Middlesbrough Institute of Modern Art, United Kingdom. Carter was born in Dallas, TX in 1970. He lives and works in Brooklyn, NY. Internationally exhibited artist Matthew Ronay will have a solo exhibition in June 2011 at Andrea Rosen Gallery, New York and at La Conservera, Murcia, Spain in 2012. He recently had a major solo show, Between the Worlds at Artpace in San Antonio, Texas (2010) and Goin' Down, Down, Down Parasol Unit Foundation for Contemporary Art, London (2006). In June 2011 he will be included in the group exhibition Secret Societies, at the Schirn Kuntshalle, Frankfurt, Germany. Ronay was recently included in the exhibit Neue Alchemie Kunst der Gegenwart nach Beuys, at the Landesmuseum, für Kunst und Kulturgeschichte, Germany (2010). Ronay has also been in group exhibitions at the Astrup Fearnley Museum for Modern Art, Oslo; ARoS Aarhus Kunstmuseum, Århus, Denmark; Center for Curatorial Studies, Bard College, Annandale-on-Hudson, New York; Serpentine Gallery, London, England and the 2004 Whitney Biennial, New York. Ronay was born in Louisville, Kentucky in 1976. He currently lives and works in Brooklyn, New York. 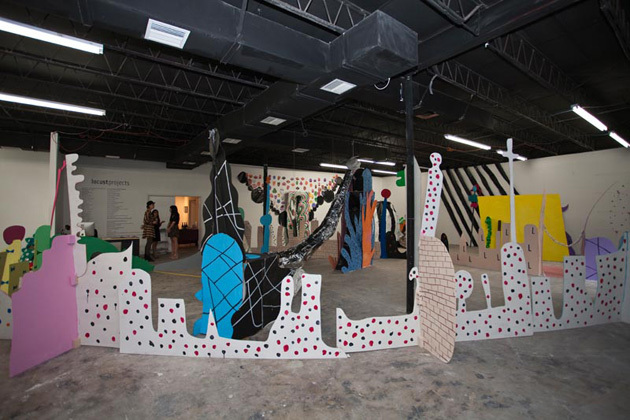 Locust Projects' exhibitions and programming are made possible with the support from: The Andy Warhol Foundation for the Visual Arts; Galt & Skye Mikesell; Hannibal Cox Jr. Foundation; John S. and James L. Knight Foundation; Miami-Dade County Department of Cultural Affairs, the Cultural Affairs Council, the Mayor, and the Miami-Dade County Board of County Commissioners.